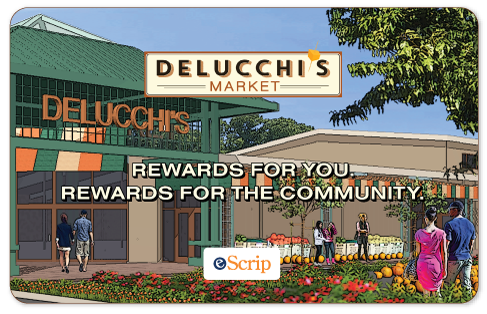 Delucchi’s Market utilizes Electronic Scrip Incorporated (“ESI”), 10091 Streeter Rd., Box #12, Auburn, CA 95603, to administer a program that offers you rewards for shopping with us (the “Delucchi’s Market Rewards Card Program”). We hope that this Delucchi’s Market and ESI Privacy Statement (the “Privacy Statement”) will help you to understand how we collect and handle the personal information we obtain and how we may or may not share it. In addition it is important to us that you understand how we safeguard the personal information you provide to us. You may voluntarily register with the Delucchi’s Market Rewards Card Program. When you enroll, you will be asked to provide your name, address, telephone number, and email address. We use this information to send your rewards via the US Mail and to provide you with an update on your rewards status via email. In order to process rewards in your name, when you present your Delucchi’s Market rewards card (the “Rewards Card”) at checkout, ESI collects details of your transactions such as date of purchase and the total amount spent. We do not collect or provide to ESI any details regarding the specific items you purchase. ESI uses your personal information to operate the Delucchi’s Market Rewards Card Program as well as to provide you with information, updates and special offers that relate to the Delucchi’s Market Rewards Card Program. By using this site or providing personal information to us you agree that we can communicate with you electronically regarding security, privacy, and administrative issues. Delucchi’s Market and ESI do not license, sell or rent any personally identifiable information, to any third parties for purposes other than the operation of the Delucchi’s Market Rewards Card Program. Third parties may also be used to help us administer the Delucchi’s Market Rewards Card Program. We may share personally identifiable information with these third parties, who will be bound by legal agreements to maintain the confidentiality of your information and not to use or disclose the information provided to them for any purpose other than the requested services for the Delucchi’s Market Rewards Card Program. ESI may disclose your personally identifiable information, without notice, in the following circumstances: (1) If required by law, (2) to protect and defend the rights and properties of ESI (3) to protect and defend the personal safety of the users of the Delucchi’s Market Rewards Card Program (4) in the event of a business change such as a company acquisition or merger. We will maintain records that keep track of your sign up/contact information as well as the rewards earned in your name from your participation in the Delucchi’s Market Rewards Card Program. This site has security measures in place to protect the loss, misuse and alteration of the information under our control. The transfer of confidential information such as Rewards Card numbers and transactional data are communicated via encryption. ESI’s Web server and database reside behind a firewall in a secure datacenter with fault tolerance, offsite backup and firewall protection. ESI maintains a multi-tiered system with no direct access to the database. If you would like to update, change or delete any information you have provided to Delucchi’s Market and/or ESI, please do so by calling 1-866-989-3201 or by clicking here – please be sure to include your Rewards Card number in your communications.